Kyle Howard and Curtis Parker, who are members of the Portsmouth Stealth coaching staff, along with the Stealth’s Jason Basye (50) demonstrate proper offensive line blocking. Several camp participants go through offensive drills during the first day of the camp on Sunday. 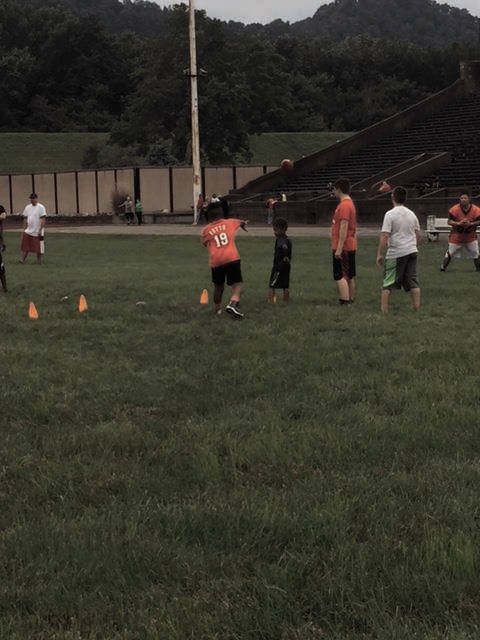 The Portsmouth Stealth semi-professional football organization is currently hosting a free peewee football camp, which is being hosted by the Portsmouth City Soldiers Youth Football Club in connection with the Stealth. The camp is open to all Scioto County youth in grades three through six regardless of school or team affiliation. Camp participants were held at Spartan Stadium from June 25 to June 27 and will also be held from July 9 to July 11 from 6 to 8 p.m. Dinner is being provided to all camp participants. Registration questions can be directed to Shane Shortridge at (740) 876-2365.